Prepare to scream because I’m about to talk about the demise of the Mercedes-Benz Vario again, a subject that we have returned to repeatedly over the past couple of years. 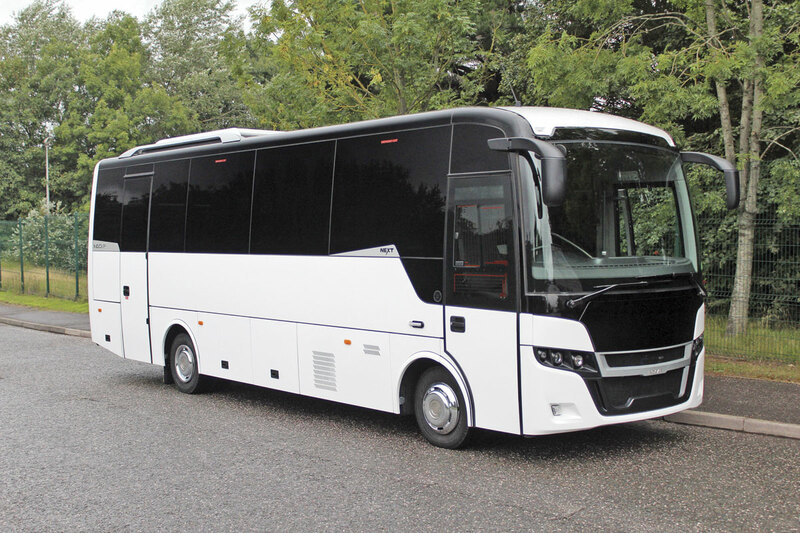 Its disappearance left something of a void in the small coach market that the various manufacturers and dealers have filled in a variety of ways. 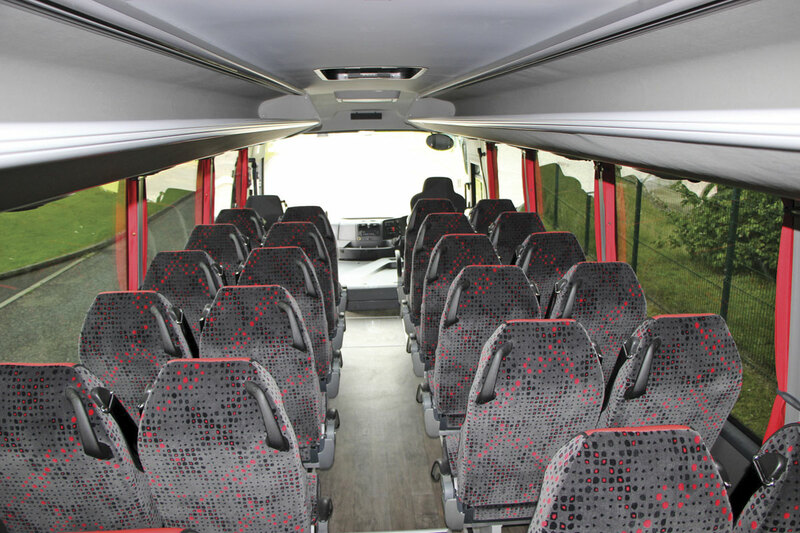 What has caused the industry difficulty is that the Vario was such a versatile beast that it met every need from 25 to 33 seats and there isn’t another chassis that has the same capacity. For the associated Moseley group of companies, Moseley (PCV), Moseley in the South and Moseley Distributors, the answer has been to introduce not one but three new options. We have already bought you details of the smallest of these, the Sitcar Voyager bodied Iveco New Daily, in our issue 1332 (19 June 2015). This lively performer covers the sector up to 25 seats in a package that offers a whole new level of drivability compared with the Vario. For Moseley, this will satisfy the lower end of the Vario market and the first orders have already been placed, but for the bulk of the market something bigger was required. Moseley had been talking to the Spanish specialist small coach manufacturer, Indcar, for some time prior to announcing their intention to offer the Next, and had showed the Iveco Daily mounted Mobi welfare vehicle at the NEC in 2013. Indcar is not a stranger to the UK; its coachbuilt products were first imported on Iveco chassis by the Coach Europe organisation. The Mago, sold in the UK as the Maxim, and the later Maxim 2, were mounted on the Iveco EuroMidi CC chassis, offering a stylish small midicoach. Also offered was the Eco3 on a larger version of the EuroMidi chassis. This was available in Ireland on the MAN 11-220. For a period, Iveco also contracted Indcar to produce coach versions of the Daily minibus that it offered directly through its network, and a very good job they made of it, with a neat powered plug door arrangement. Subsequent to the closure of Coach Europe, the coachbuilt Indcar Wing body was offered by several different dealers including Noones and BASE. Although most of the vehicles sold in the UK initially were on Iveco chassis, Indcar had never limited itself to building on one manufacturer’s products, it had always offered a range of options to the Spanish and other markets, having been one of the earliest Spanish coachbuilders to recognise the importance of diversifying beyond the Spanish market. 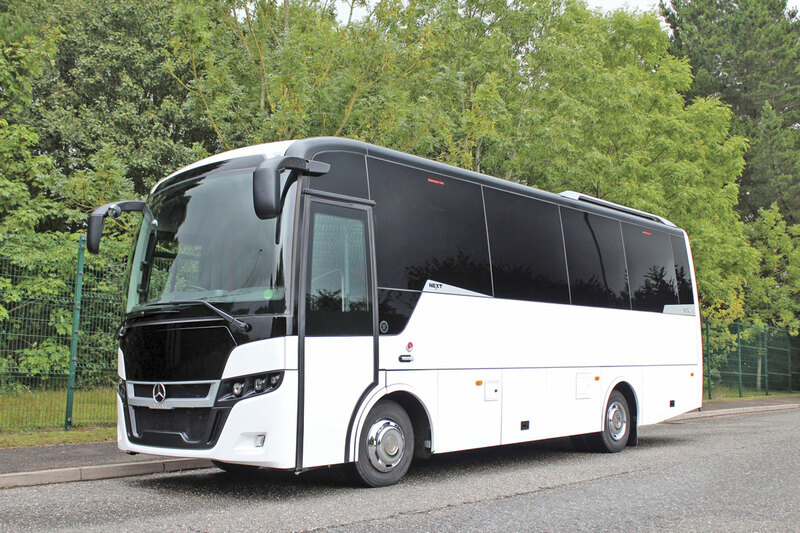 At the FIAA Show in Madrid last year, the first examples of the new Next coachbuilt body were launched on both MAN and Mercedes-Benz chassis. Shortly afterwards, following the announcement that the Moseley companies would be offering it in the UK, the Mercedes-Benz Atego mounted Next was displayed in left hand drive form at the Euro Bus Expo Show in Birmingham. Here it was well received at an event that positively brimmed with new options for this sector. 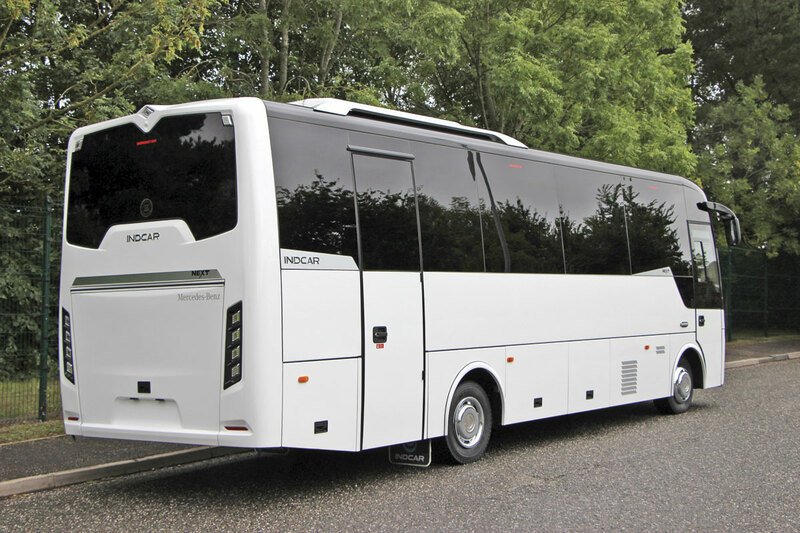 The top model in Indcar’s extensive range of bus and coach bodywork, the Next is constructed at the modern factory facility in Arbucies, just across the road from the Beulas plant and very near to the Noge facility. Some of the dealerships serving the UK agonised over which weight versions of the Atego they should base their products on, because of the greatly different cost and capacity implications, but Moseley have ensured they should be able to satisfy as broad a spectrum of customer demand as possible by opting to offer the Next on both 10.5-tonne and 12-tonne Atego chassis. The first examples of both have now arrived in the UK and last week Stuart Jones went back down to Taunton, where he has been rather often lately, to see the latest additions to the Moseley portfolio. It is the first time the companies have sold Indcar, though not the first time they have offered the Atego. The smaller of the two is known by Indcar as the L8. 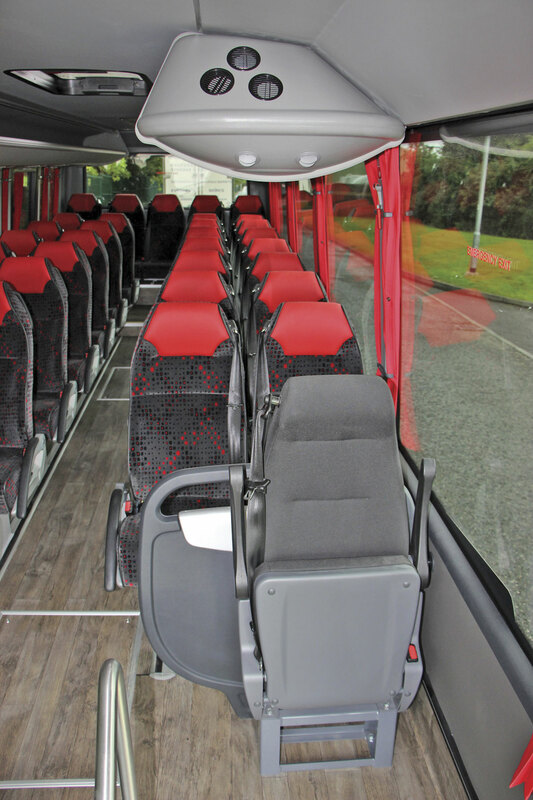 This is 8,660mm long and gives a maximum seating capacity of 33 plus courier, though you can have less seats and enhanced legroom if you wish. It is mounted on the Atego 1023L chassis with a wheelbase of 4,220mm and a maximum GVW of 10.5-tonnes. It is powered by the 211hp (155kW) Mercedes-Benz OM934LA four-cylinder, 5.132-litre engine mounted, as on all Ategos, in-line at the front. The OM934 matches the output of the pre Euro6 six-cylinder units delivering the 211hp at 2,200rpm with peak torque of 850Nm at 1,200-1,600rpm. It can be supplied with a choice of a manual or the six-speed PowerShift 3 automated manual transmissions and this had the automated unit. Offering a higher capacity both in the number of seats, the GVW and the provision of the six-cylinder, 7.698-litre Mercedes-Benz OM936LA engine is the Next L9. This is 730mm longer at 9,390mm and can accommodate up to 37 reclining seats. Talked of as a 12-tonne chassis the actual GVW of the 1224L is just a tad beneath that at 11,990kg. The power unit develops 238hp (175kW) at 2,200rpm and torque of 1,000Nm at 1,200-1,600rpm. Both the four and six-cylinder units are considerably more sophisticated and fuel efficient than their predecessors, the OM904 and OM906, with dual camshafts, electronically controlled wastegate valves and EGR (exhaust gas recirculation). The example I saw had the Powershift 3 transmission. Mercedes-Benz claim 5% fuel savings for the Euro6 engines compared with their Euro5 predecessors in the Atego. With more weight and a higher body than on the Vario, you’d expect this to result in fairly similar levels of consumption to those operators were accustomed at Euro5. Mechanically, other aspects of the Atego chassis include two parabolic leaf springs on the front axle and air suspension on the rear incorporating two airbags, hydraulic shock absorbers and an electronic level stabiliser as well as parabolic leaf springs. Mounted on 17.5-inch steel wheels shod with 235/75-R17.5 tyres, it has disc brakes, a Telma retarder, a very effective engine brake and a 180-litre diesel tank as standard along with a 25-litre AdBlue tank. Structurally the framing of the structure already satisfies the forthcoming ECE R66.02 standard, while the body has polyester front panels and a composite rear. Personal preferences differ considerably but to my mind the Next is among the most successfully styled of the new generation of Atego based products, despite have a more upright front profile than most of its competitors. 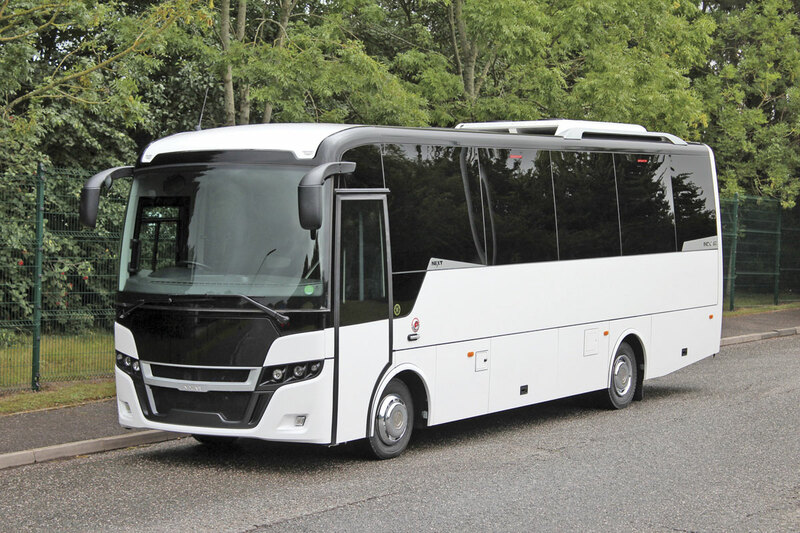 The look is more big coach than small coach, even on the shorter L8, with deep windows and mouldings breaking the line that are similar to the dorsal fins found on the side of the Setra ComfortClass. The Thermo King air conditioning is mounted on the roof towards the rear where it is effectively disguised by brightwork side rails. With front engined designs, deciding where to put the door demands a lot of consideration. Locating it at the front looks more big-coach-like and offers greater flexibility in interior layouts, but that said a centre door within the wheelbase was never a barrier for the Beluga and other Vario based products. Deciding to put it at the front does pre-suppose that you can develop a step arrangement that will enable passengers to navigate their way past the engine without performing contortions. Some readers will no doubt recall the solution offered by an earlier generation of coachbuilt Atego mounted vehicle offered through Moseley, the Sitcar Marlin, which had a steep step arrangement that went over the engine and back down into the saloon, and the solution Indcar has come up with is infinitely better than that (in my opinion). Including that from the ground, the Next has five steps to the flat saloon floor, one more than when it appeared at the NEC. The first into the well is followed by one at 45 degrees, with the third at a further 45 degrees bringing it level with the bodyside, after which there are two more to the saloon. The additional step inserted ensures that with the natural rhythm of transferring your weight from one foot to the other, you end up facing the exit when descending the stairs, rather than facing the interior as was previously the case. Handrail provision around the entrance was good but I thought the decency screens rather flimsy. Both models have the same front end section with a total overhang of 1,600mm. 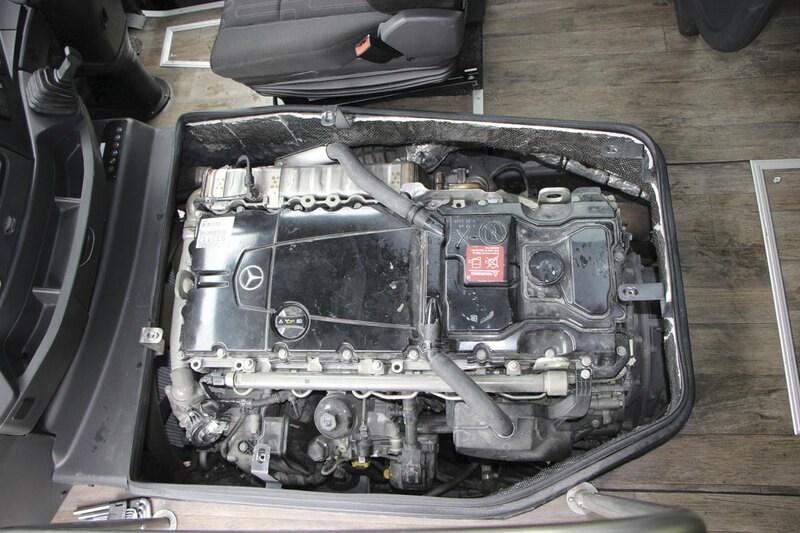 The engine is mounted beneath a moulded cover that requires an Allen key to remove the five securing bolts. I would have liked to see some kind of trim applied to this as it is so prominently located. The driver’s seat and the main dash elements are lifted from the standard Atego, and although neither was fitted with them it is Moseley in the South’s intention to add some kind of dash kit to future examples. The driving position, which has a footwell lower than the rest of the saloon, looked a good one with everything to hand. 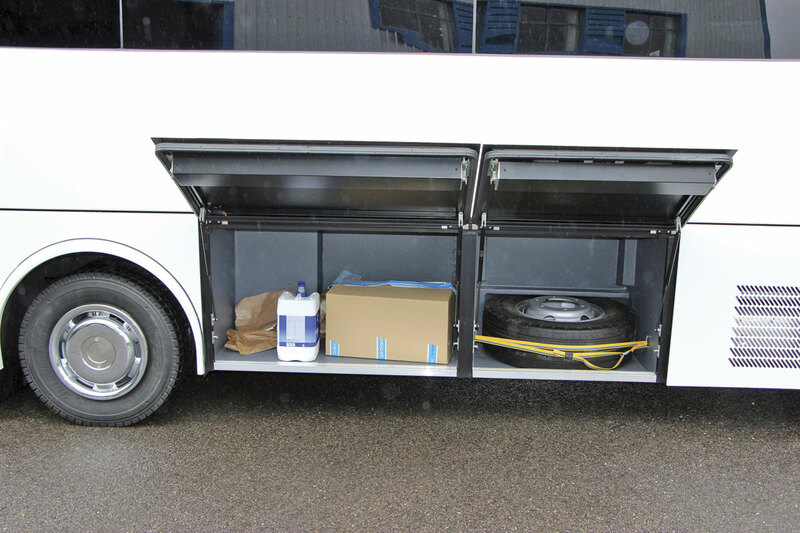 A driver’s door is provided, access through which is not difficult to achieve. To the right of the dash is the touch control screen for the multiplex system that controls all of the key body functions including the monitors, heating, lighting, heated mirrors, foglights and reverse alarm. The L8 picks up the section of the Moseley offering previously occupied by the Sitcar Beluga 3, and in doing so has a class act to follow, because the Beluga was a well finished and well regarded small coach, albeit slightly more capacity constrained than some of its competitors, reflecting Moseley’s reluctance to sell anything that might be stretching the spirit of the weight legislation. In the L8, you can criticise the window arrangement ahead of the emergency door, the additional framing for which is close to one of the other window pillars, limiting the view for the passenger alongside it. The L9 does not suffer from this in the same way; where pillars do fall alongside a seat a passenger can see one side or the other of them. 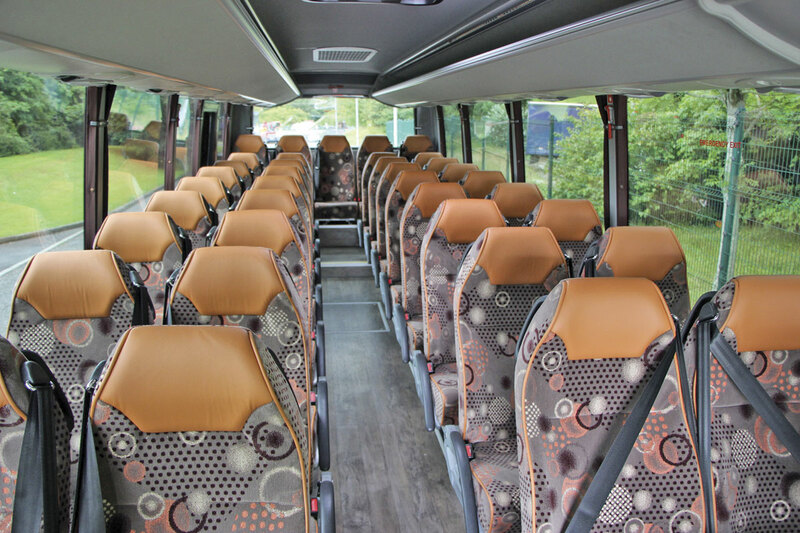 Moseley have standardised on the Kiel Avance 250 as the standard seat for all variants with leather headrest and piping as standard. 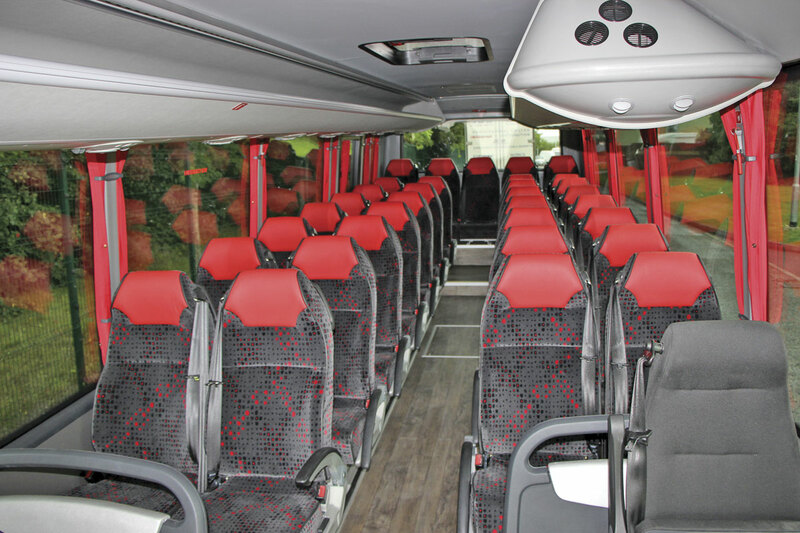 It will be possible to specify leather side panels if you wish, as well as magazine nets, tables and other accessories, though the standard includes a folding aisle armrest, three-point externally mounted seatbelts and a grab handle. I found the Avance 250 a comfortable and well contoured seat. Squab width is 400mm on each and the pitch spacings are 735mm on the L8 and 730mm or more on the L9. 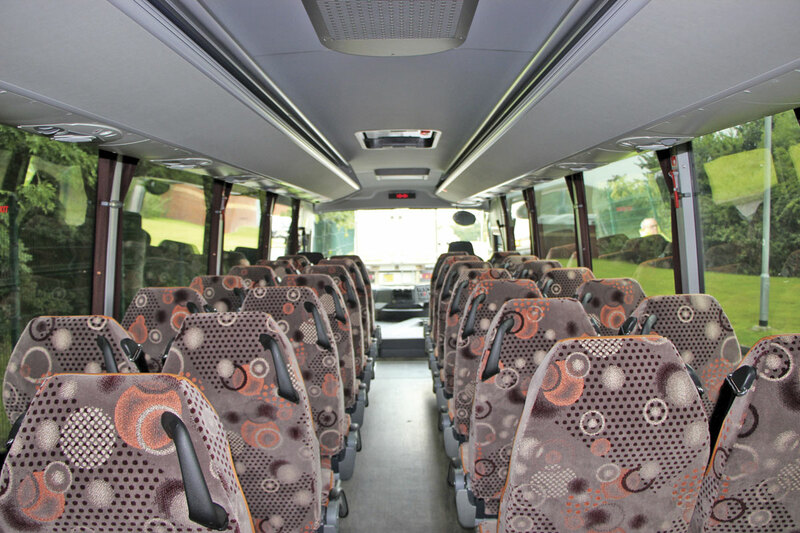 On both versions the courier seat (also Kiel Avance) is at the front of the nearside, and there is a single step up beneath the penultimate seat row. A wooden plank effect floor finish was specified on both vehicles I saw. The combination of the seats, flooring and the ceiling in shades of grey gave a good ambience. The Ellamp racks are continuous with no internal dividers and have personal service units appropriately placed on the undersides, the interior body sidecasings are trimmed in a grey leather effect plastic material, and there are pleated full draw curtains with retainers. Heating is a blown air system and the radio, CD and microphone system is Bosch, though the 18.5-inch powered drop down monitor is by B&B, a system that has proved reliable in Sitcar products. This monitor replaces the fixed flat screen unit fitted against the bulkhead on the first LHD versions. A digital clock is also provided. There were elements of the finish you could criticise on the prototypes, particularly with regard to some of the ceiling panel sealing, but based on what I have seen on other Indcar products I’d have expected such issues to be resolved on production vehicles. Luggage provision is good, with 5.67cubic metres quoted in the brochure. Accessibility to it is similarly generous with both rear side panels opening in addition to the rear boot lid. As well as the rear capacity there are sidelockers in the centre on both sides, that on the nearside also housing the spare wheel, though doubtless some operators will remove this. At the Madrid launch much was made of the moveable bulkhead system Indcar was offering at the rear of the coach to give operators the opportunity to increase the space available for luggage if and when they needed to. The idea was that by mounting the rear seat row on rails you can remove the two double seats in the penultimate row and slide the rear bulkhead forward, bolting it in place to create an enhanced luggage area. I think there are limitations to the concept, which might well generate rattles and other noise and possibly dirt ingress. 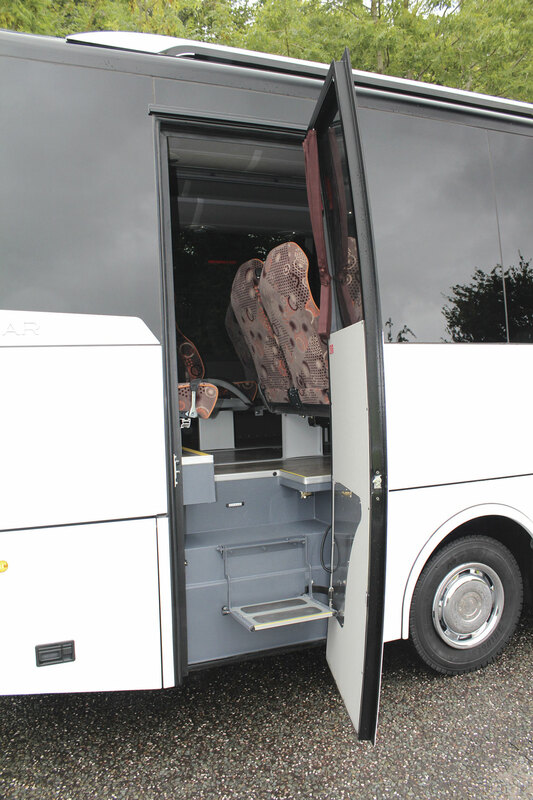 On most UK coaches it would not be possible to specify it anyway because the rear offside emergency door would preclude it, but it may be possible to do it if instead of the rear emergency door you opted for a centre continental door. Available only on the 12-tonne variant, it might be beneficial if it meant you didn’t need to tow a trailer on occasions. If you do tow one, the technically permissible maximum towable mass would be 1,850kg with a centre axle trailer and 750kg with an unbraked trailer on both models. Incidentally, opting for the centre continental door costs you one double seat if you want to retain an all forward facing seat layout, though it would be possible to get 37 seats if you reversed the first row on the offside (and presumably put a table in between it and the second row). Alternatively you could stay at 35 seats and remove the decency screen to the rear of the driver, allowing a fridge to be incorporated. 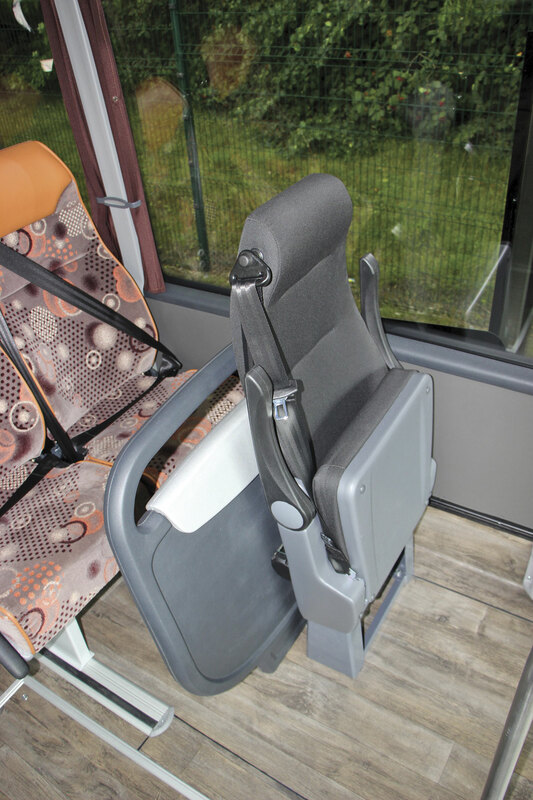 Other options available include a centrally mounted wheelchair lift, which can be integrated within a centre continental exit arrangement if you wish. Also offered is a saloon mounted toilet compartment, which would be located at the nearside rear so as to maximise the available seating. 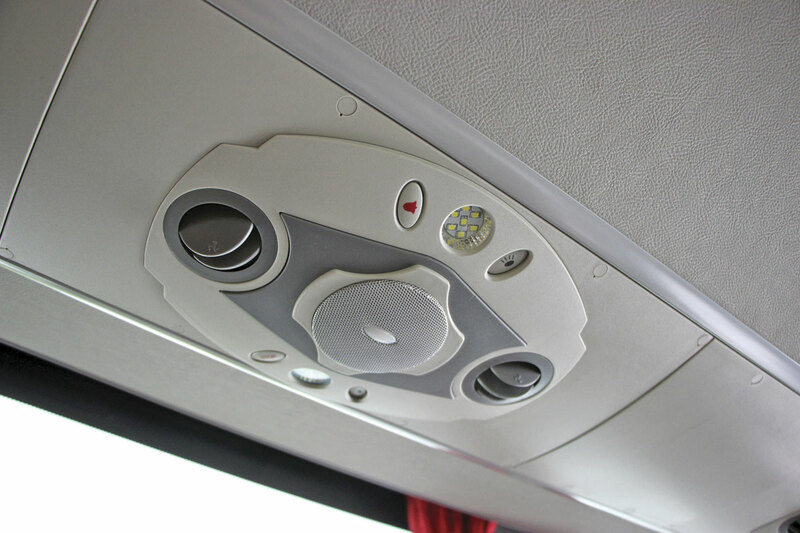 You could also opt for additional glazing in the coach the roof in the form of a window within the front dome. Since the first vehicle was shown in Birmingham, both Moseley and Indcar have been working hard to refine the specification to meet UK operator needs, and there have been quite a list of improvements made as a result, some of which have already been mentioned. I ran through the others with Bryan Reed, Moseley in the South’s highly capable Service Manager. At the NEC, the radio unit was located in line with the engine into the driver’s left but has been moved to his right, just inside the cab door, where it can be reached without leaning. 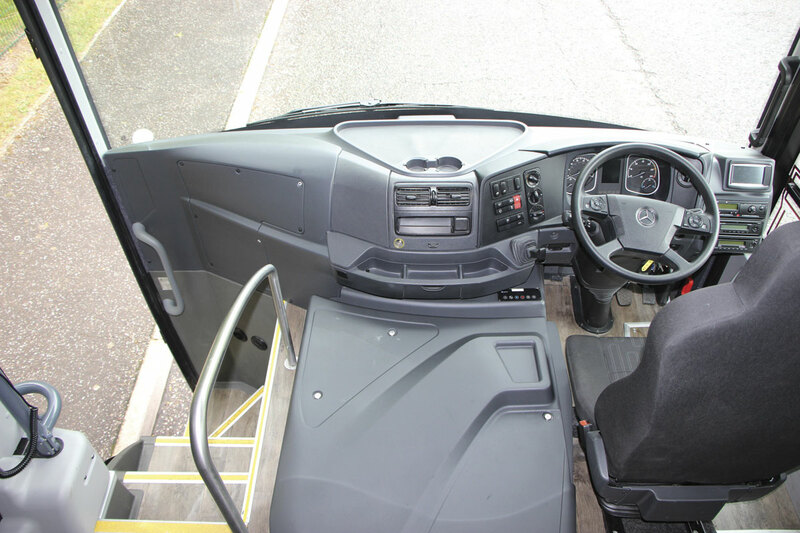 Also moved are the VDL digital tachograph and the air conditioning controls which were previously in a moulded unit above the driver’s head. The tacho is now next to the radio alongside the driver while the air conditioning control will be in the centre of the dash to the driver’s left as it was on the L8 we inspected, (though the 12-tonne prototype had it elsewhere). The moulded overhead unit remains in place though there would not appear to be any continuing need for it. Also changed is the driver’s signalling window unit which is now heated and has been raised around 30mm so that the bar is not directly in the driver’s eye line. 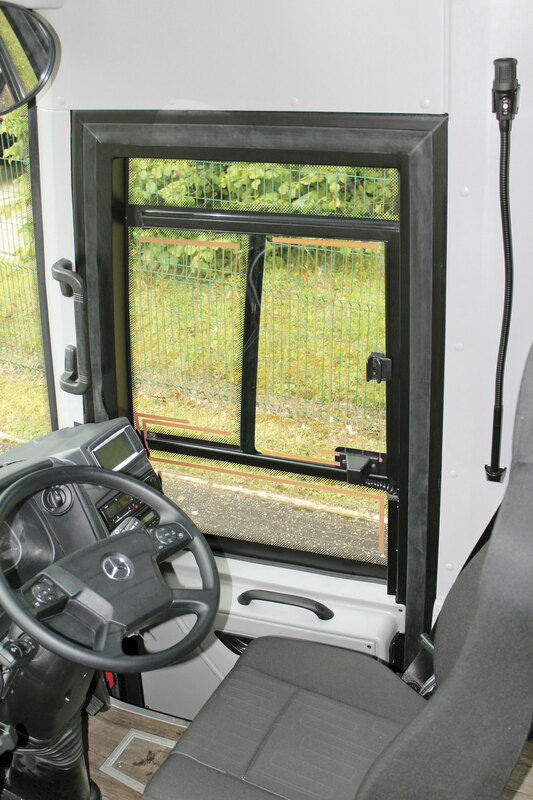 Separate sunblinds for the driver and courier are now electrically rather than manually operated. Beneath the bonnet a significant change is the relocation of the oil filler to just behind the opening front bonnet cover. It was previously higher mounted alongside the header tank for the water system where it was both difficult to fill and likely to be confused. To the rear of the coach, the original pantograph style boot panel had the dual drawbacks of a mechanism that took up a lot of space, preventing the loading of luggage all the way to the rear, and a relatively low height making it an injury hazard and difficult for the driver to load. Instead, a top-hinged unit is now mounted more loftily creating more space as well as making it safer and more straightforward to use. There was also the adjustable bulkhead but that has already been covered. On the nearside, the flaps for the diesel and AdBlue fillers have been improved to make them more robust. Nearest the front, that for the AdBlue is a lockable unit and while the diesel flap does not have its own lock the fuel pipe itself does. A point Bryan highlighted that had impressed him was the way the multiplex system worked. It has five nodes and on each of them are 12 inputs and 12 outputs, each with a red light that illuminates when the function they handle is working. An Indcar specified item, the nodes are by the Canadian company, Vansco, and the information they provide not only simplifies things for the maintenance team at home, it could potentially be very useful when a driver encounters problems away from home. Depot Manager, Marcus Worth, also pointed out that all of the lower body panels, including those without handles because they allow locker access, are fitted with hinge mechanisms to enable them to be opened easily. Already the first Next orders have been placed and making the running early on is the 10.5-tonne option. 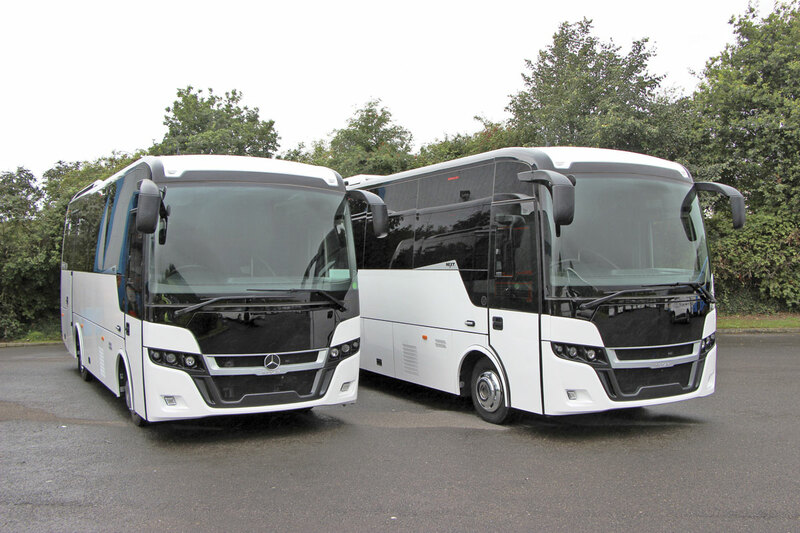 In Scotland, Moseley Distributors are supplying two to Marbill Coach Services of Beith, each with 33 seats, while Moseley in the South have taken an order for another 33 seater from Apple Travel of Slough. A 12-tonne Next L9 has also been ordered but Allan Vaulter was unable to reveal who the customer was. There is a step up in price from the previous Sitcar Beluga 3 bodied Vario but you are getting more coach, more sophistication and the price of moving to Euro6 which would have been incurred if Mercedes-Benz had decided to retain the Vario. The retail price for the 10.5-tonne 33-seat L8 to a standard specification is £145,000, while the extra four seats and the six-cylinder unit of the 37-seat L9 will take that up to £155,000. Bryan told me that a full range of glass for them was already in stock before the first coaches arrived. Although these two prototype coaches had areas on them that I believe will be improved on subsequent production vehicles, I think they showed the Next’s considerable potential to meet the needs of the market. In terms of a replacement for the Vario it is the four-cylinder L8 that most closely matches the specification, while the six-cylinder L9 provides that bit more capacity to enable the Next to compete with other manufacturers who have decided to move their ranges up the capacity spectrum. There will be many operators who continue to lament the passing of the Vario but I think most drivers and passengers will much prefer the new generation.